What happens if a team member is removed from an unshared email conversation? 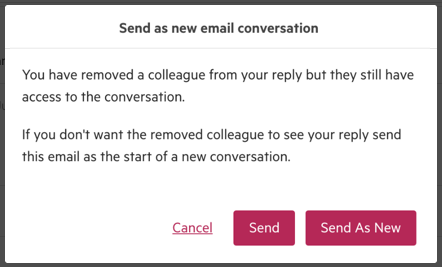 If you choose to remove a colleague who was part of an unshared conversation, you are able choose to keep the email as part of the same conversation (and give your colleague access to it) or send the email as the start of a new conversation (ensuring the new email is kept private). If you choose to send as a new conversation, the original email conversation will then provide a message and link to the new email conversation.